Quirky, sassy, well written story about a "sidekick" of a superhero and their crew. Alright, also a little weird. Not the base story of always being in someone's shadow and learning to love yourself for who you are but for the demon's use of "the first thing they see" when crossing the portal into the human realm. Becoming a cupcake? Really? Can you see cupcakes flying around with fangs and claws? A disembodied hand doing the same? Taking on the shape of a marketing poster? I had a hard time taking any of that seriously but for a flighty, comic relief I supposed it would work for most. Being pragmatic, I questioned the how's and whys of the superheroes gaining their powers. Obtained on the first "demon invasion", did they get bitten, why didn't everyone get powers? Why were some weaker than others? I finally realized that I needed to stop nitpicking the flaky premise and just go with the flow. I almost gave up on the story in the beginning because of the those things but something kept me invested. I think it was the interactions of Aveda, Evie and the rest of the crew. Have you ever been a sidekick to your best friend? Have you ever been the best friend who has a sidekick? Lessons to be learned from both characters in this book. Even though I felt like I knew how the whole story was going to unfold, I was still compelled to see it on the pages. I was right about the story but I enjoyed the telling none the less. Life lessons abound in this read. Ranging from becoming confident in yourself to family discourse and recovery, it seemed to travel the gamut. I thought that part of the story was well done. It had a little romance and some adult jargon which gave it a more adult flavor or I could have seen this as a young adult publication. If you are looking for something a little different and can easily assimilate fanciful characters this might be one you will want to pick up. I give this 3.5 "WTH" sheep! 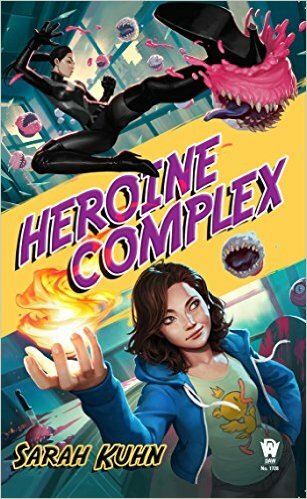 Sarah Kuhn is the author of the forthcoming Heroine Complex trilogy, starring Asian American superheroines, for DAW Books. Pitched as “The Devil Wears Prada with superheroes,” the first book chronicles the adventures of Evie Tanaka, a put-upon personal assistant who is forced to pose as her diva superhero boss and must embrace her own hidden talents in order to protect our world from a demonic invasion. Also featured in this book: hot romance, evil cupcakes, and supernatural karaoke battles! Heroine Complex Book #1 will be released July 5, 2016 and you can read an excerpt right here! Sarah also wrote the geek girl romantic comedy novella One Con Glory, which has been dubbed “Pride and Prejudice at Comic-Con.” One Con Glory earned praise from io9 and USA Today and is in development as a feature film. Learn more about One Con Glory here! Recently, she wrote The Ruby Equation (with artist Sally Jane Thompson) for the Eisner-nominated romance comics anthology Fresh Romance and is currently writing a series of Barbie comics. 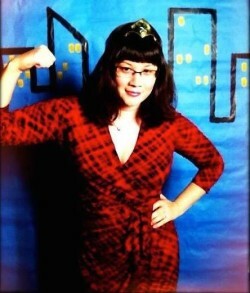 Additionally, she has written personal essays on Sailor Moon cosplay, comic book continuity, and geek girl culture for Uncanny Magazine, Apex Magazine, AngryAsianMan.com, and the Hugo-nominated anthology Chicks Dig Comics. A longtime entertainment journalist, her articles on everything from Oscar season to Vulcan mating rituals have appeared in Back Stage, Geek Monthly, IGN.com, The Hollywood Reporter, StarTrek.com, Creative Screenwriting, and The Oakland Tribune. Sarah has spoken on popular panels like San Diego Comic-Con’s “Geek Girls Exist” and “Sci-fi That Will Change Your Life,” GeekGirlCon’s “Geek Girls in Popular Culture,” and WonderCon’s “The Asian American Superhero,” “Not Your Sidekick: Heroes of Color,” and “Building the Modern (Super)Heroine.” In 2011, she was selected as a finalist for the CAPE (Coalition of Asian Pacifics in Entertainment) New Writers Award.